Lake Ariel in Lake Ariel in the autumn. Lake Ariel's Location within Pennsylvania. First settled in 1822 by the Jones family, the town was first called The Stock Farm and later Jonestown or Jones Pond. The first farm was located at the south end of the lake. Lake Ariel Park was a major destination for many in the late 19th and early 20th centuries. Since the late 19th century through the 20th century, Lake Ariel has had various thriving businesses. There were numerous sawmills, and Lake Ariel also had different factories such as a cheese factory and a chair factory. Many locals also held jobs at the ice houses and Lake Ariel Park. Lake Ariel Park was a major tourist area for the community. It contained a pavilion for picnics and dancing. There were also rides such as a waterslide, a rollercoaster called the Cyclone, carousels, and miniature train rides. The park also had a beach where visitors could go swimming or boating. The owners of Lake Ariel Park also purchased an airplane so that their visitors could pay to get rides in the plane. The Lake Ariel Park also led to the increased popularity of the Lake Ariel Hotel which was formerly known as the Columbia Hotel. The Lake Ariel Hotel stood in disrepair for many years until it was finally torn down in 2011. Unfortunately, the Lake Ariel Park had a worse fate. Due to summer hurricanes and bad winters the park had to be closed down in the early 1950s. Some businesses did withstand the test of time. John T. Howe started his gas station in 1919, the business was passed down to his son and is still in business today. It now is called Howe Convenient Market. It is a gas station and store but it is not in the original building. Another business that had a few changes but is still running today is the Wayne Garage. It was built in 1915, making it the oldest business in Lake Ariel. After it was sold to new owners in 1958 it was changed to a body shop and remains one today. The Lake Ariel Hotel in recent years. It was torn down in 2011. The original St. Thomas More was dedicated in 1942. In 1996 the construction for the expansion of the church began; the rectory was torn down and rebuilt across the street, the church was converted into a steeple and offices and a new, larger church was built connected to it. A church from the past that remains unchanged today is the Avoy Christian Church, not only is it still standing but it still has services on Sunday. The Gravity Pentecostal Church is also still intact today, but it is now used as a house. The original St. Thomas Moore Church in Lake Ariel PA. You can see the new church in the background. The center of Lake Ariel is the setting of most of the community's businesses, although there are numerous others. Lake Ariel also contains many churches and religious institutions. St. Thomas More's Catholic Church is located in the center of the community, while several Protestant churches are located at various places in the community. In Lake Ariel, there was the Lake Ariel Elementary School. Children from 3rd to 5th grade attended this school. It was part of the Western Wayne School District which also has schools in the nearby communities of Waymart, Hamlin, and Varden. It was torn down in 2016. Western Wayne's newest school, Evergreen Elementary, opened August 31, 2011. It is located on Route 191 between Lake Ariel and Hamlin. The school replaced Lake Ariel Elementary and Hamlin Elementary and houses Pre-k through 5th grade. According to the Western Wayne School District website the projected cost of the school was $18 million. The new facility is the premier 'green' school in the state. The school attained the Leadership in Energy and Environmental Design Silver Certification for its use of geo-thermal heating and cooling, and solar and wind energy. WCRV 97.7FM is a low-powered station serving Lake Ariel, Cherry Ridge, and Southern Honesdale. ^ White, Israel Charles; Dolph, John M. (1881). The Geology of Susquehanna County and Wayne County (Report). 23. Board of Commissioners for the Second Geological Survey of Pennsylvania. p. 5. Retrieved 18 December 2014. ^ "District Magistrate". Wayne County, PA. Wayne County Courthouse. 2014. Archived from the original on 2014-11-27. Retrieved 18 December 2014. ^ a b Mathews, Alfred (1886). 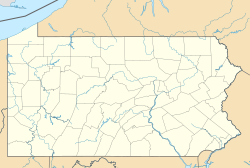 History of Wayne, Pike, and Monroe Counties, Pennsylvania. Philadelphia: R.T. Peck & Company. p. 785. Retrieved 18 December 2014. ^ a b c "Lake Ariel". Geographic Names Information System. United States Geological Survey. 2 August 1979. Retrieved 18 December 2014. ^ "Look up a ZIP CodeTM". USPS.COM. USPS. 2014. Retrieved 18 December 2014. ^ "Ariel Creek". Geographic Names Information System. United States Geological Survey. 2 August 1979. Retrieved 18 December 2014. ^ "Lake Ariel". Geographic Names Information System. United States Geological Survey. 2 August 1979. Retrieved 18 December 2014. ^ "Brooks Lake". Geographic Names Information System. United States Geological Survey. 2 August 1979. Retrieved 18 December 2014. ^ "Wildwood Lake". Geographic Names Information System. United States Geological Survey. 2 August 1979. Retrieved 18 December 2014. ^ Western Wayne School District Archived 2011-07-28 at the Wayback Machine, . This page was last edited on 9 September 2018, at 04:09 (UTC).